Wessex Morris Men were founded in 1957 by a group of young men out of The White Horse Morris Men. 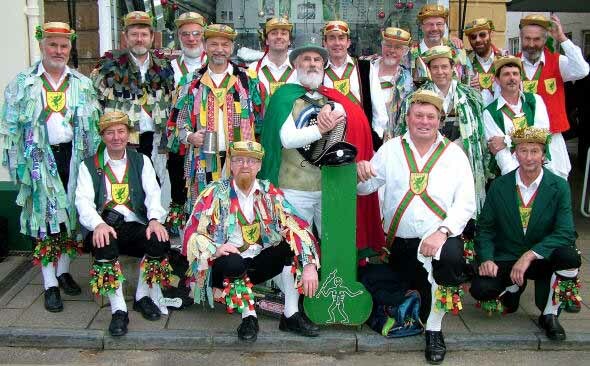 We are an all male side, dancing mainly in the Cotswold tradition. The side is an active member of the Morris Ring. We dance out, mainly in the late spring and summer months, around West Dorset and nearby. 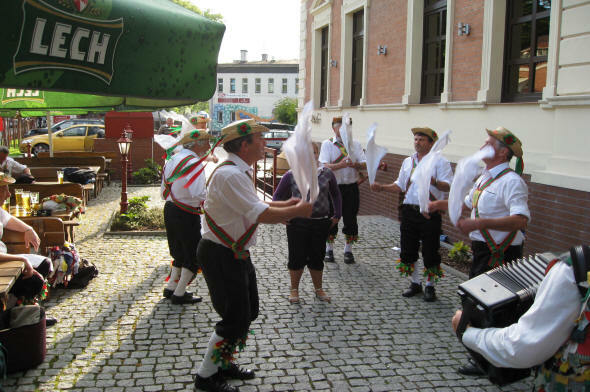 During summer we dance every Monday evening (see our programme for details). We also dance at shows, fetes and other public and private events. If you would like to book us, or would like to join us, see our contact page. We are an international side and have in previous years visited Poland, Germany, France, Austria Channel Islands, Southern Ireland and even the darkest, remotest parts of Dorset (passport most essential). We also visit other sides within the UK and try where we can to attend their Ales and Ring meetings. Recent events we have been involved with include the Hartley Ale in Summer 2015, where a fantastic time was had by all. Working with the Douzelage (a twinning group of Towns) we have visited a number of European towns, there being one town in each of most countries in the EEC. We generally make one or two foreign visits each year. In October 2015, this was to Bundoran in Southern Ireland. During our closed season (September to April) we practise at Pulham Village Hall on Mondays between 8:00 pm and about 10:00 pm. We then cross the road to the Halsey Arms for a music and social session. Over the years, Wessex Morris Men have become associated with Cerne Abbas, in Dorset, and can be seen dancing on the old maypole site above the Giant's head at sunrise on May Day each year. We also dance and perform a mummers play at our Christmas party (usually the Monday before Christmas), and at lunch time in Cerne Abbas on Boxing Day. We are always on the look out for new recruits, so if you are reasonably fit (or would like to become so) and would like to learn the dance (or can already dance and have recently moved to the area) why not come along to one of our weekly practice sessions. 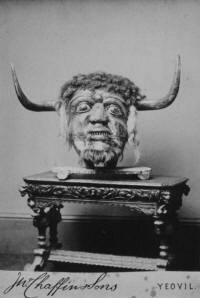 The side are the owners of the infamous Dorset Ooser (or Oozer), the new one that is, a giant of a creature with a large wooden head and even larger horns, carved from a passing log by John Byfleet using a small pen-knife. It is cloaked in the hide of a peripatetic calf, supported on a stick, and ceremonially embedded in the groin of a Wessex Morris Man. Poor old Alan Cheesman always draws the short straw when it comes to carrying the Ooser, something to do with the fact he is the only bloke big enough and strong enough to lift it. Other people have tried on numerous occasions and ended up with bleeding sores on their shoulders, even Alan has a rough time of it and has to stop and rest at regular intervals. This is the main reason the Ooser is only seen on May day and St. Georges Day. It is said, by some, to be the Dorset manifestation of the Horned God; also known as Herne the Hunter, Cerne, Cernnunos, etc. The new version was made by John Byfleet in 1973 and can be seen at The Dorset County Museum in Dorchester. If you want to see the Ooser in action you will have to get up very early on May day and meet us at the top of the Cerne Giant before sunrise. The original Dorset Ooser, (as seen in this photo from between 1883 and 1891 by J.W.Chaffins and Sons of Yeovil), was last seen in a Doctor Cave's loft in Crewkerne around 1935 and is reported to have been sold by Doctor Cave's servant to a stranger from East Chinnock, but in a very sorry state of repair. The horns had fallen off and woodworm had made the mask very fragile. It is now the popular opinion that: if it still exists at all, it has decayed to such an extent that it will be unrecognizable as the Dorset Ooser. If you would like to read more, read The Dorset Ooser, by Daniel Patrick Quinn (reproduced by permission), or you can visit the Ooser himself in the Dorset County Museum in Dorchester. Our horse is called Cadbury. A very engaging personality as you can see from the picture. Horses and other animals have traditionally formed part of the morris entertainment. Cadbury doesn't always come out with us. In 1966, Don Byfleet (our recent foreman) and Heather Byfleet were invited to join the South West Dancers touring folk festivals in France. As Don was part of the Sword and Morris teams, he decided that an animal would add colour and realism to the performance. A wooden horse was decided on. He therefore made a wire frame and constructed a horses head thereon using mainly plaster of paris bandage. Hair, ping-pong eyeballs and a long skirt were added and the mouth was fashioned to be opened and closed by the operator in the skirt. What colour should it be? Don furkled around in his garage and found a half used tin of paint the colour of chocolate. The squire at that time lived in the village of North Cadbury, near Yeovil. Hence the Wessex hobby horse "Cadbury" was born. The plaster of paris proved unstable and began to crack and fall apart, so the mascot was re-modelled in papier maché. Repaired, refurbished and repainted over the years, Cadbury still survives to amuse the crowds today. The fool is supposed to be the best dancer in the side, keep the men in order, act as a go-between with the audience and should really be an upright, sensible and sober person. Anyway, you can see what we've got, below. 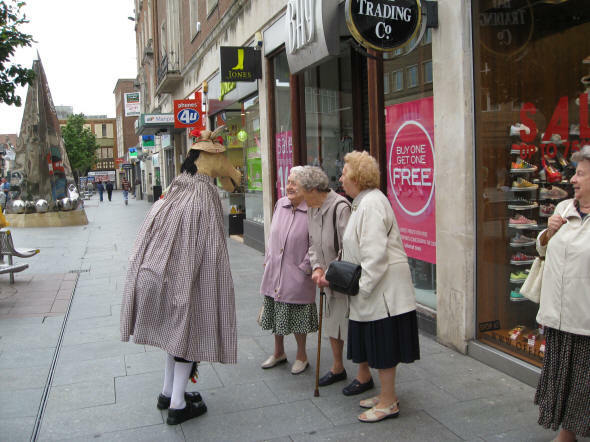 Mummers' plays have been performed in England since the late 1700s and most Dorset villages would have had their own play. It is very likely that there was a play in Cerne Abbas but, unfortunately, all traces of it have been lost, so Wessex Morris have "imported" a play from Quidhampton, near Salisbury. Nevertheless, since our play has been performed regularly in Cerne Abbas for over thirty years... we now consider it to be "traditional" to Cerne. Like all Southern English plays, the Cerne play involves a series of fights between Saint George and his various adversaries, followed by a revival of the slain combatants by a comic doctor and a concluding song and collection. 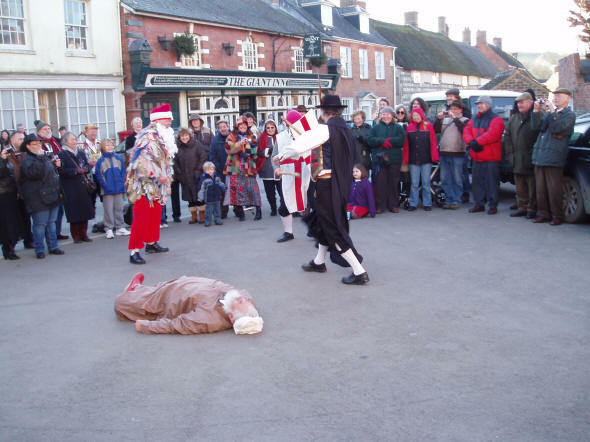 At our Christmas Party, at the Red Lion (now the Giant Inn), Cerne Abbas, we also perform the traditional King George Mumming play. A few years ago, we unexpectedly found ourselves in the news when the Dorset County Council were informed by some public spirited person, that we were going to perform in the Red Lion and the New Inn. The pubs were called by the Council and told that: if we performed our play, then they would be in breach of licensing laws and would be prosecuted. Not to be outdone, we performed our play in the street. With a few amendments to the dialogue that is, i.e.. out goes I, King George instead of in comes I King George etc. All in all, this caused quite a stir, with articles being written in the Dorset Echo and other newspapers. This was at a time when the Government intended to introduce changes to the licensing laws in the following July. Had the new law not been changed, we would not have been allowed to dance, sing or perform our plays without special licenses, effectively pricing ourselves and our friendly landlords out of the folk business. Fortunately a petition was accepted by the Lords, who amended the act, to the benefit of Mummers and Morris Men everywhere. After an exhilarating evening's morris practice, what better place to go for a chat and a sing and a play, than the Halsey Arms, just across the road from the village hall.